« I've been trained for hostage crises, suicide bombers, chemical attacks... but what I've been seeing lately? I'm scared. » | the Olivia Dunham fanlisting. 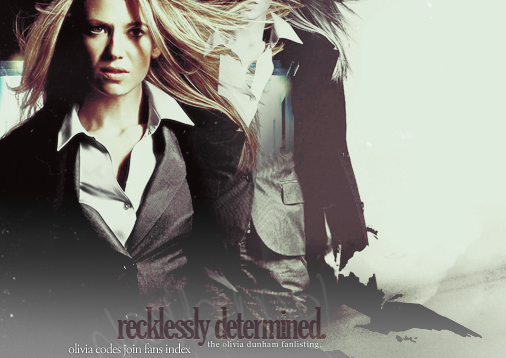 ... to Recklessly Determined, a fanlisting for Olivia Dunham (Fringe), marvelously portrayed on screen by Anna Torv. This fanlisting is listed at The Fanlistings Network (under Characters: TV) and is part of I Am... Fan. Feel free to take a code and join if you're a fan!